This book provides a micro-historical analysis of the emergence and contemporary dynamics of recent ethnic sub-nationalist insurgencies in South Asia. Using comparative case studies, it discusses the causes of each insurgency, analyses the trajectory and dynamics of each including attempts at resolution, and highlights the wider theories of ethno-nationalist insurgency and mobilization. Bringing together an international group of contributors, the book covers insurgencies in India, Sri Lanka, Pakistan, Nepal, and Bangladesh. It questions why ethnic sub-nationalist insurgencies occurred at particular points in time and not at others, and explores the comparative trajectories of these movements. The book goes on to discern reappearing patterns of conflict escalation/de-escalation through the method of comparative process-tracing. It argues that while identity is a necessary factor for insurgency, it is not a sufficient one. Instead, ethnic mobilization and insurgency only emerge when it is activated by tension emerging from political competition between ethnic and central state elites. These elite-led dynamics, when combined with favourable socio-economic and political conditions, make the ethnic masses primed to accept the often symbolically-rich appeals from their leaders to mobilize against the central state. 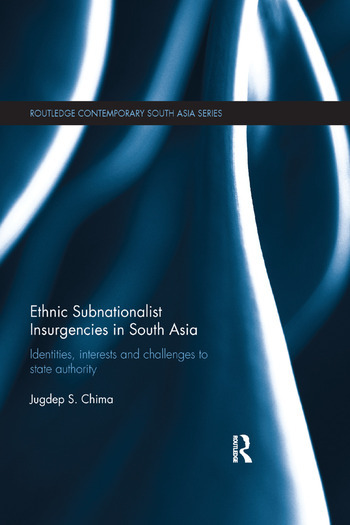 Providing an important study on ethno-nationalist insurgencies in South Asia, the book will be of interest to those working in the fields of South Asian Politics, Security Studies and Ethnic Conflict. Jugdep S. Chima is an Assistant Professor of Political Science at Hiram College, Ohio, USA. He was previously a Lecturer of Political Science at the University of California, Berkeley, USA, and Associate Editor for South Asia at Asian Survey at the same institution. He is author of The Sikh Separatist Insurgency in India: Political Leadership & Ethnonationalist Movements (2010).